It was high time for a return visit to Rob & Diane Coles wonderful Meadow Farm Garden & Nursery at Feckenham in Worcestershire to see the Echinacea trial beds and get some inspiration from the planting schemes. This time I decided to make it a visit with friends so 14 of our Cottage Garden Society group turned up for a tour with tea & cakes! Just at the crucial “let’s have a group photo” moment, several members went missing in the shrubbery so we have a reduced headcount in this shot! As usual, the beds and borders were looking magnificent, stuffed to the gunnels with delicious perennials of all colours and descriptions. Each time I go I either see something new or something I didn’t see last time. This time I made a note to acquire two new to me plants which would fit well into my garden. Firstly, Allium angularis, a short drumstick allium which, Diane assures me, flowers for months and doesn’t seed about like many others, preferring instead to gradually clump up and behave like a good allium should. The thing that made me take notice was the delightful bluey mauve colour which appear to start off almost white and gradually darken. It was also absolutely covered in honey bees and Diane reckoned it was one of the best bee plants in her garden. The other was Gladiolus papilio ‘Ruby’ which was another clumper as Di assured me she originally planted just one bulb. Not cheap but good value if it multiplies like this one has. Needs fertile but well drained soil and gentle support to hold it’s weighty spear of velvety red flowers. And, finally, tea and cakes. The Raspberry Bakewell was delicious! Visited a friends pretty cottage garden this morning specifically to see her wonderful wisteria which is in all it’s glory. This spectacular twining climbing plant adorns the front of Wendy and Alan’s cottage and is not only beautiful to look at but also releases a wonderful fragrance when in flower which is not sickly sweet but almost musky. Cleverly bent round corners on wires and trained to perfection, this wisteria is not exactly easy maintenance but definitely worth the effort. 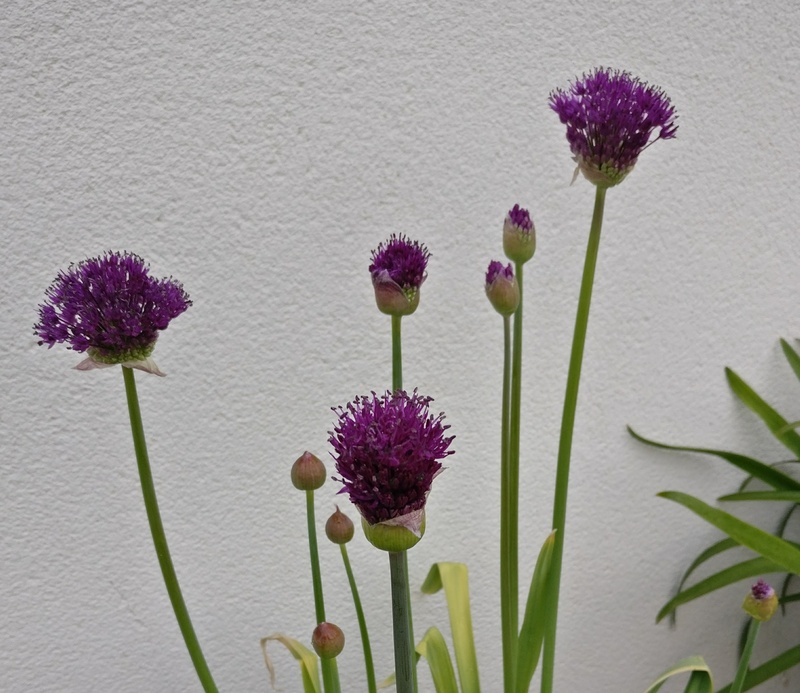 What a strange Spring, Allium ‘Purple Sensation’ almost fully open on 26 April, that’s another first for me! Sometimes it’s the happy accidents that make the all the difference like this Euphorbia characias and Clematis macropetala, what a lovely colour combination. Always exciting to see Euphorbia griffithii ‘Fireglow’ piercing through the ground. It loves my heavy clay soil. The Fritillaria imperialis just before I spotted a Lily beetle! Who says Hyacinths don’t grow well after being forced in pots. This one is five years old and getting better every year. I am so used to sowing seeds and waiting 5 – 15 days before anything happens that this rocket took me by surprise. Sown on Wednesday, up on Friday! I am an enthusiastic amateur in Cheltenham who is gradually expanding his knowledge and skill, learning the finer points of gardening and trying to improve every day. This blog serves to record and clarify my thoughts, ideas, opinions and images in a way which I hope is sometimes amusing, often controversial but always interesting. I am not sure where it will take me but I am looking forward to the journey.